Update: The bill was passed during it’s third read in the Arizona Senate on Feb. 27, 2019 and was transmitted to the House. 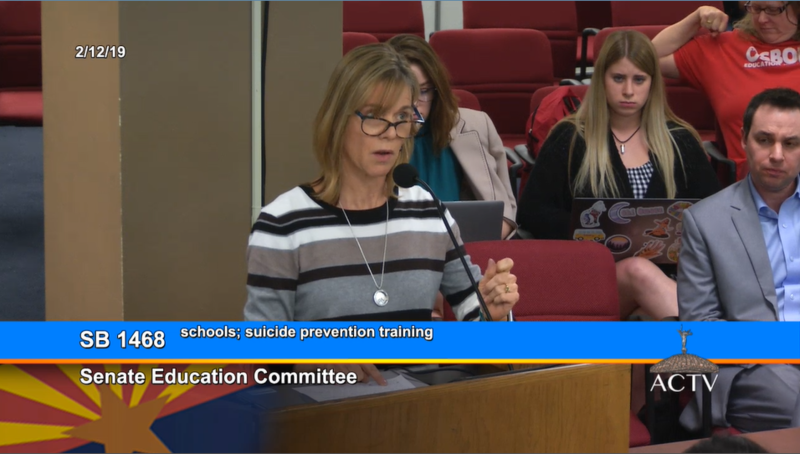 A bill that would provide suicide prevention and intervention training for school staff that has the support of families impacted by suicide was approved by the Senate Education Committee Tuesday evening. 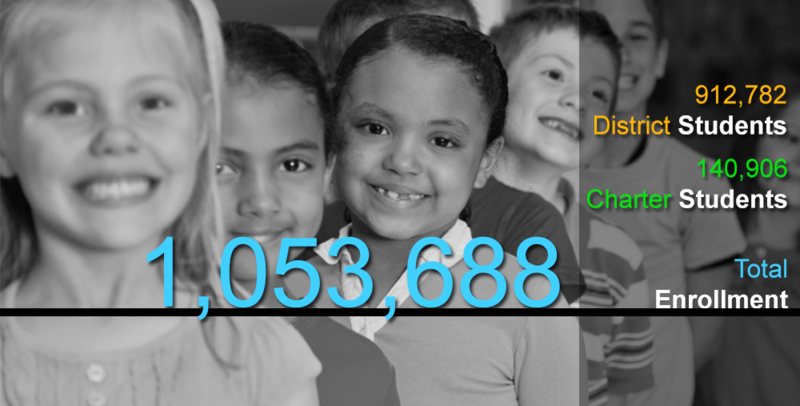 Senate Bill 1468, sponsored by Sen. Sean Bowie, would require evidence-based suicide prevention, intervention and referral training for all public school teachers, counselors, principals and other school personnel who work with students in grades six through 12 once every three years beginning in the 2020-2021 school year. 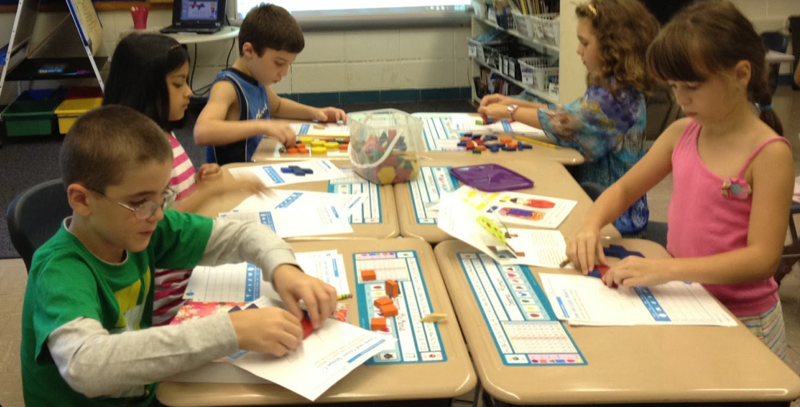 The bill would also require similar training for all students enrolled in teacher training programs at state universities. 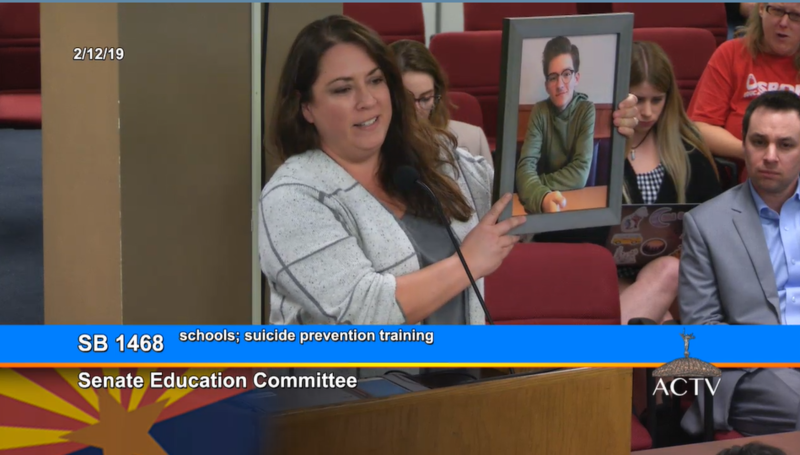 “Suicide is at a crisis level in this state, particularly with our boys,” said Lorie Warnock, a teacher whose son Mitch, a Corona del Sol student, lost his life to suicide. SB 1468 is also known as the Mitch Warnock Act. Arizona ranked 17th in the nation for deaths by suicide in 2017 according to the Centers for Disease Control. Arizona teenagers 15- to 17-years old made up 68% of suicide deaths, according to the Arizona Child Fatality Review Program Annual Report released Nov. 15, 2018. 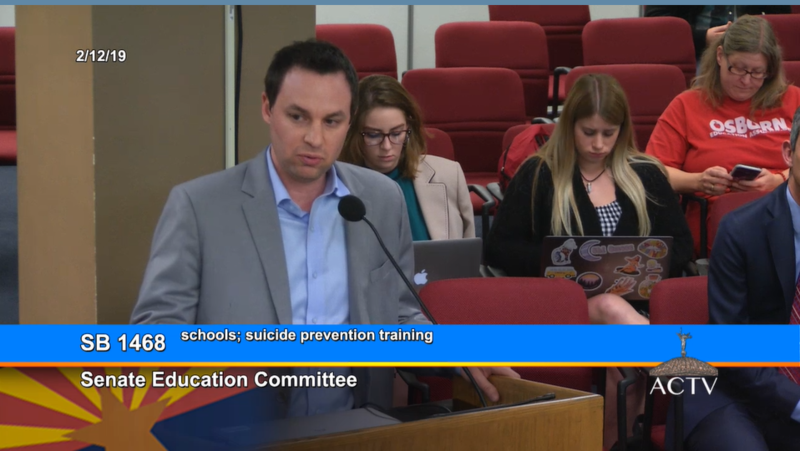 “I had the privilege of teaching and living on the Navajo Nation for three years, and I know Native American youth have four times the risk in comparison to the rest of our students in this state,” Warnock said during the committee meeting. In the past 18 months, 38 teens in the East Valley have taken their own lives, said Sheila Hedstrom-Pelger, a nurse whose son Tyler, 17, killed himself a week before he would have started his senior year. 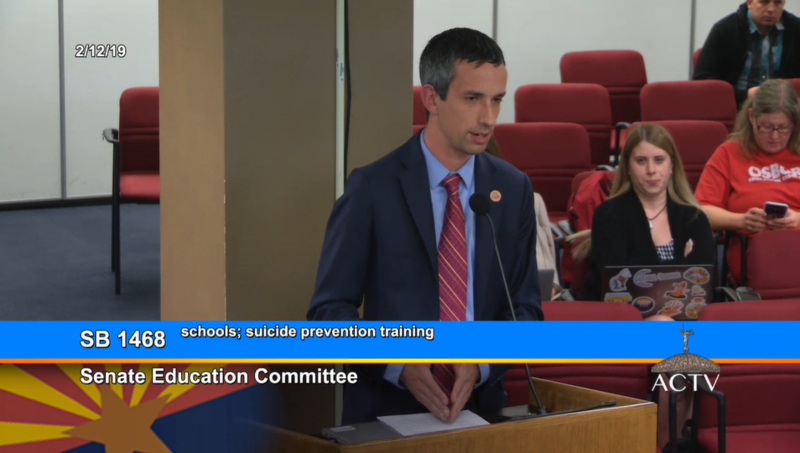 SB 1468 would “help our young people, but also help our teachers, educators and school personnel get the training they need so they can spot the warning signs before it’s too late,” said Sen. Sean Bowie, a Democrat representing District 18 during the meeting. A bill similar to SB 1468 was not approved by legislators last session, but this new bill includes changes made in consultation with Arizona Health Cost Containment System and school districts and now has bipartisan support from legislators. “When my son’s teammate died by suicide at the school where I taught, we were told by our administrators that we must not speak about suicide, because it would encourage children to kill themselves,” Warnock said. “There’s a lot of misinformation that can be corrected by free resources about suicide prevention and intervention,” Warnock said. Twenty-five states already require training for school personnel around suicide prevention, nine states require it annually, and 16 states require it once every two, three or five years, Sen. Bowie said. The bill has no state funding source designated for the suicide prevention and intervention training. 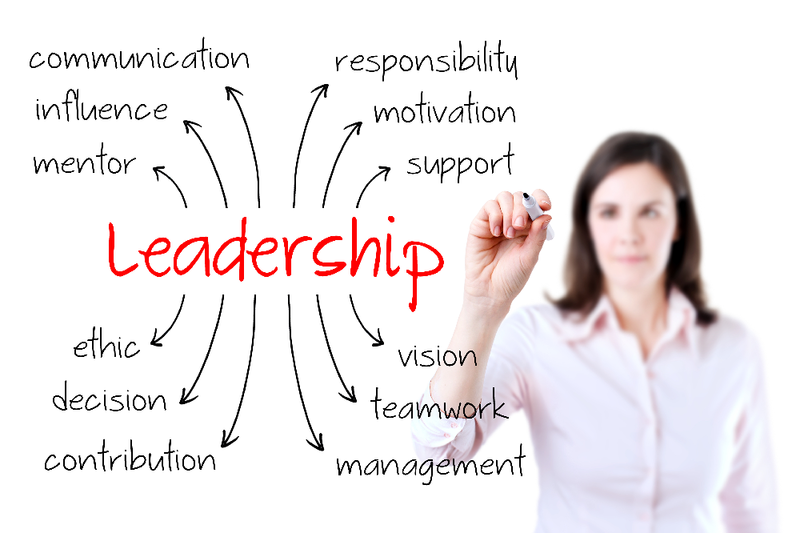 “Everybody agrees that we should do what we can within the bounds of our financial and professional capacity to help kids that are struggling with depression and mental illness,” said Chris Kotterman, director of governmental relations for Arizona School Boards Asssociation. “We always request that the Legislature provide funding for the mandates that it places on school districts, that being said, I think that the sponsor of the bill has been responsive to our concerns and has worked really hard to minimize the impact and we appreciate that,” Kotterman said, noting that ASBA remains neutral on the bill. Each year, teachers receive required training for school safety, student wellness and academic proficiency, Warnock said. “Suicide prevention and tending to social-emotional wellness have the benefit of creating and open, kind, caring, collaborative environment that increases academic performance and saves lives,” Warnock said.